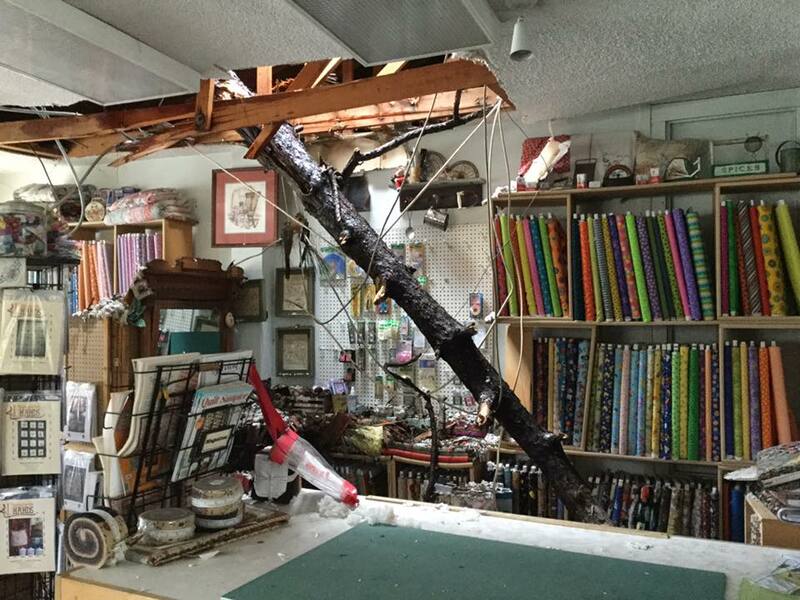 This is Debbie's Quilt Shop in Paradise CA. I thought it would be great if anyone wanted to make a block or two or three to send. 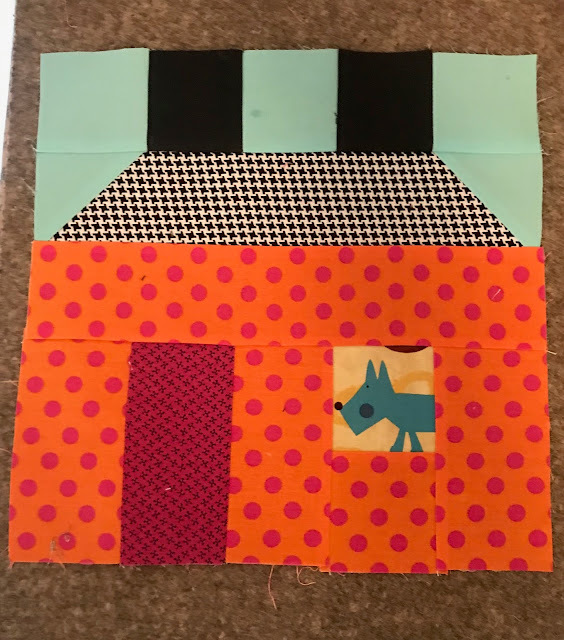 I looked for several house blocks that finished at 10" and then I remembered I did a review on Diane Knott's first book and made a little house quilt. (see it HERE) Bingo! it finishes at 10"! 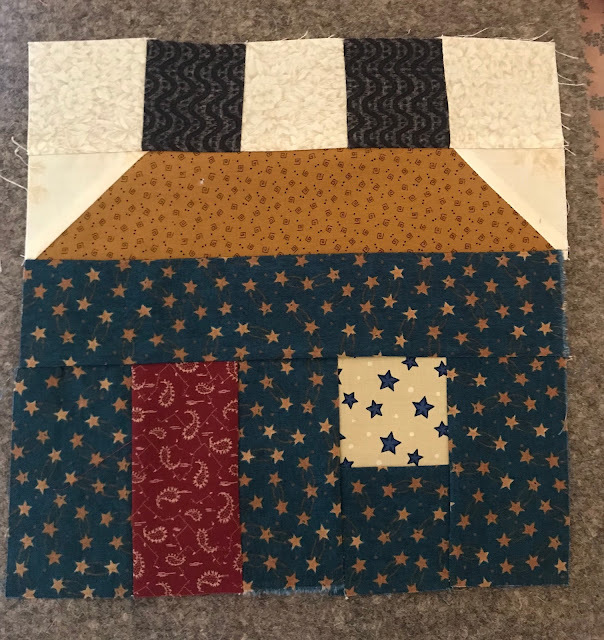 Diane Knott of Butterfly Threads Quilting has graciously agreed to let me publish the directions to make it easier for everyone to contribute house blocks to the quilters who have been burned out. 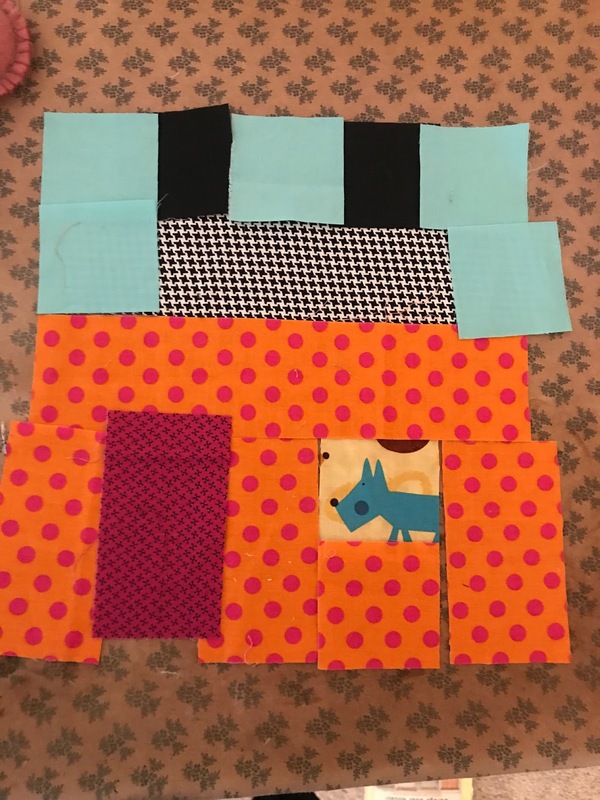 This block takes only 2 1/2 squares and strips! 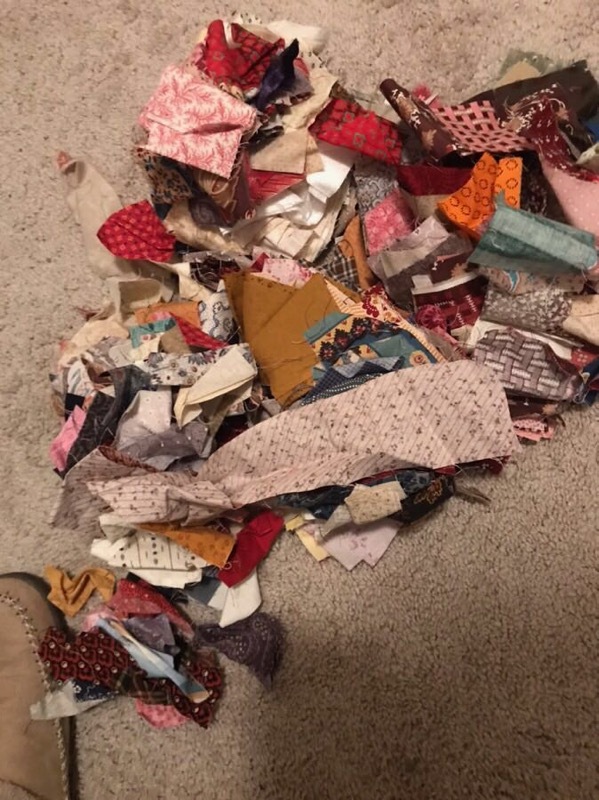 I started by dumping my 2 1/2" strips and squares bag. I hope you'll you will too! Be safe tonight and have a happy new year! These beautiful blocks are my friend, Juliann's. Aren't they gorgeous?! 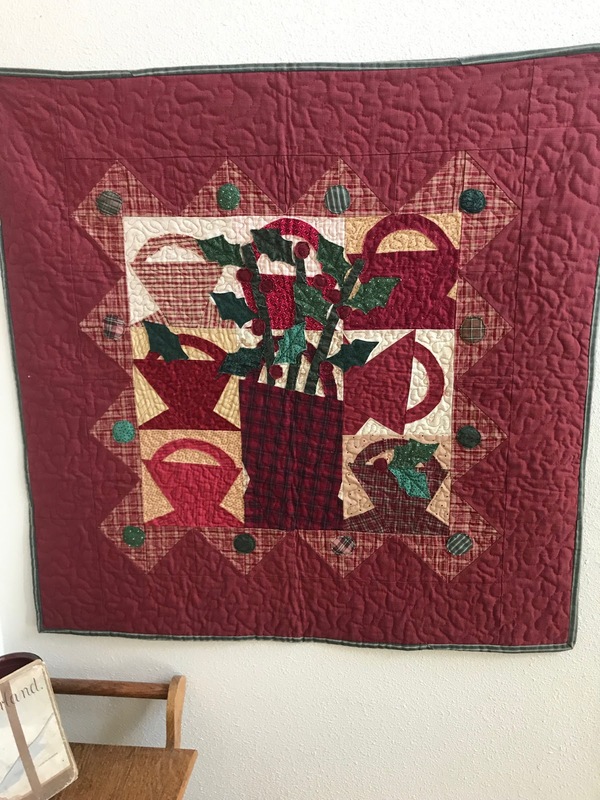 She passed this pattern to me to sell with the books and I asked her if she minded if I kept it and made it and then she showed me her beauties! Karen Beigh has agreed she'd like to do it with me this year and she already has the pattern. 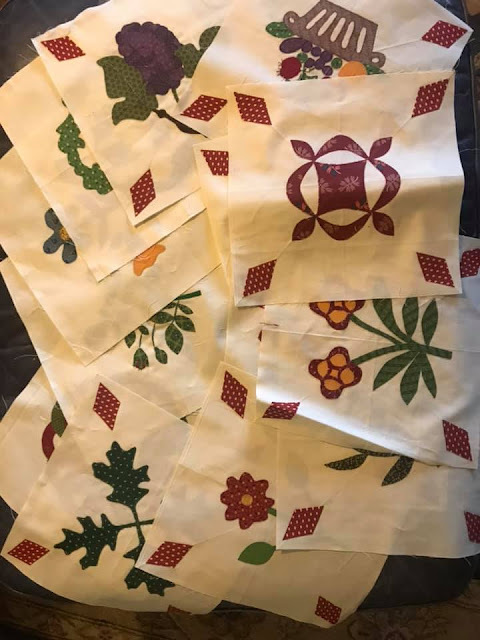 I am contemplating doing 1 each for a 4 block quilt. The pattern blocks are 20" so I could easily stretch it to about 60". We are not starting right away on this so if you'd like to join in that would be great! It is available on Jan's site for $9. See it HERE. Karen and I were trying to decide if they we inspired by any of the Carrie Hall blocks. If you know anything I'd love any information. The little beaded bells from my grandmother. 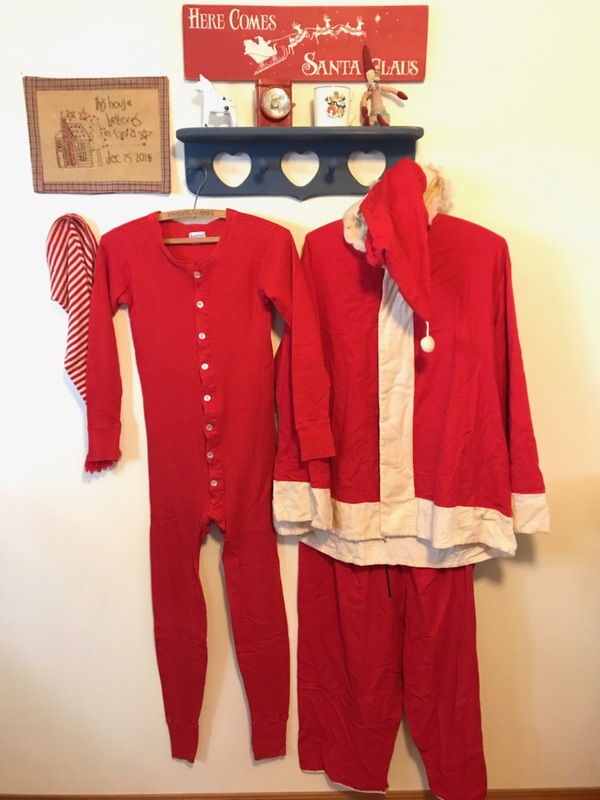 I found the red vintage long johns at the thrift store recently! I couldn't pass them up! 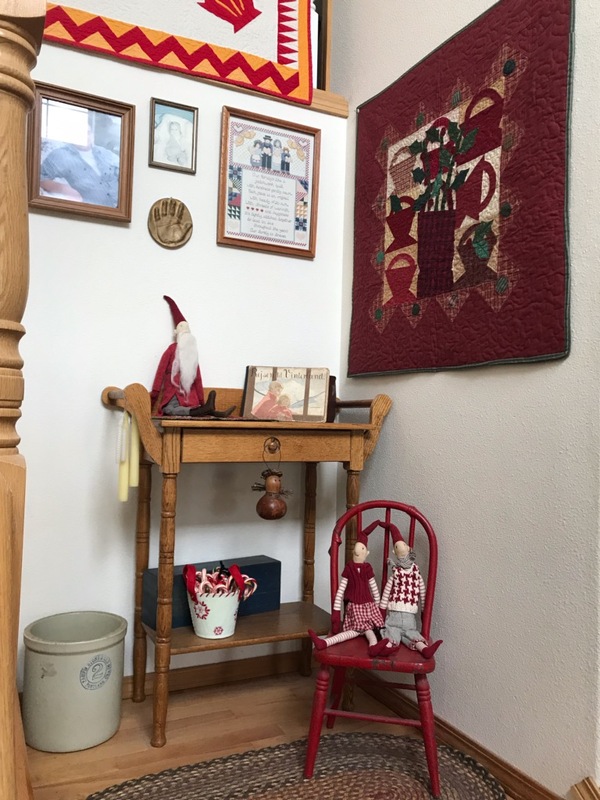 I have little Danish Nisse keeping a watch on the house. Only part of the quilt so you can see the trapunto. I think this one is my favorite green and red of mine. 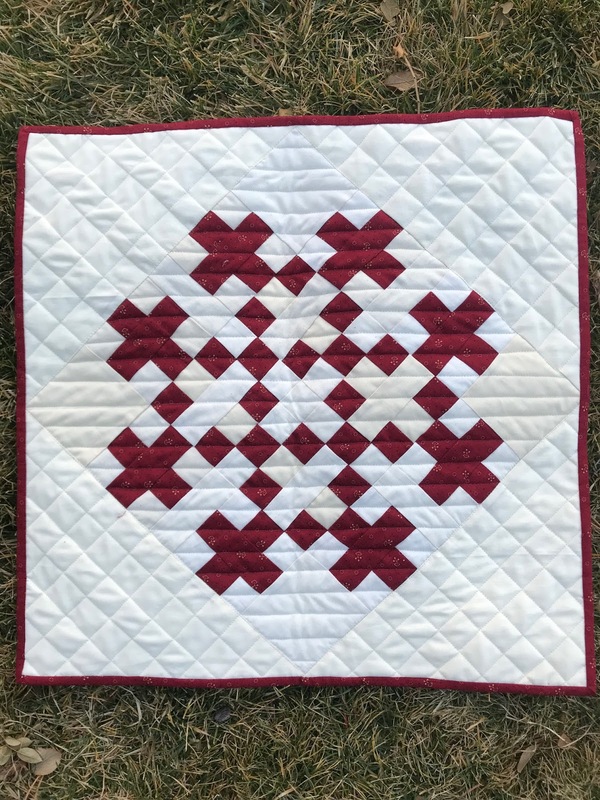 Here's a fun little quilt and pattern for you to make. 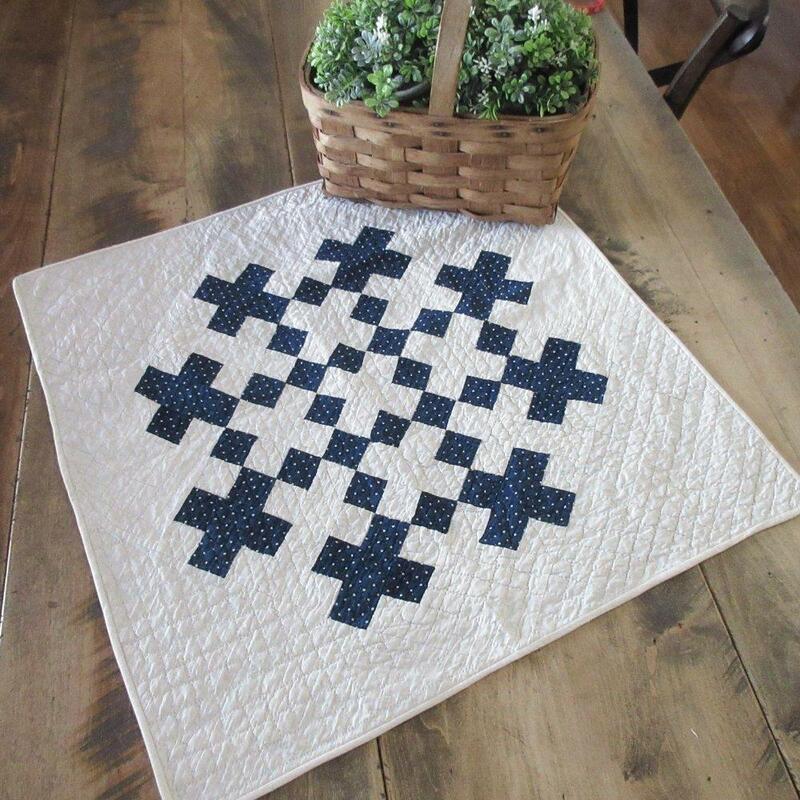 I saw a blue and white one that had been cut down from a larger quilt on ebay and thought is was super charming. I opted to make mine in red and white since that seems a bit more Christmassy. Although when it was complete all I could think of was the red cross! Now you'll get a history lesson too! The Red Cross idea was born in 1859, when Henry Dunant, a young Swiss man, came upon the scene of a bloody battle in Solferino, Italy. Some 40,000 men lay dead or dying on the battlefield and the wounded were lacking medical attention. Dunant organized local people to bind the soldiers' wounds and to feed and comfort them. 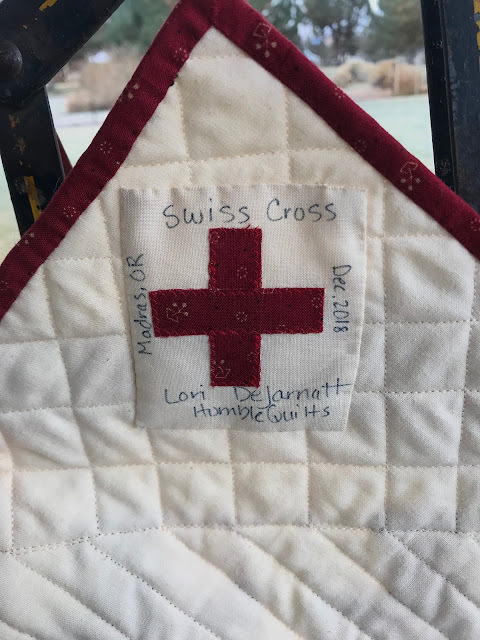 On his return, he called for the creation of national relief societies to assist those wounded in war, and pointed the way to the future Geneva Conventions. 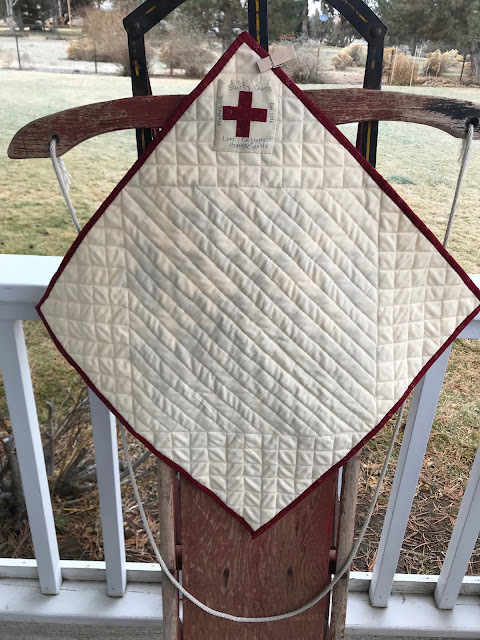 The Red Cross was born in 1863 when five Geneva men, including Dunant, set up the International Committee for Relief to the Wounded, later to become the International Committee of the Red Cross. Its emblem was a red cross on a white background: the inverse of the Swiss flag. So, here is the emblem of the Swiss flag and the red cross. This little quilt finishes about 19" square and the blocks will finish at 3"
This photo would be cuter if we had some snow. 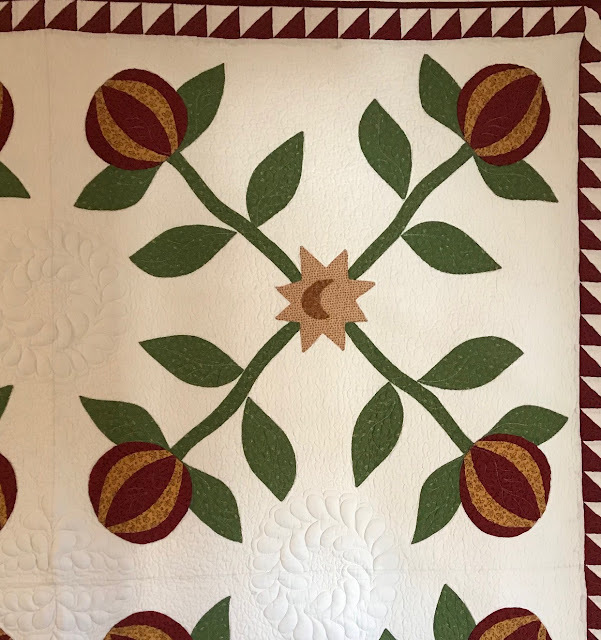 You can see the quilting here. I opted to do it by machine since this was a last minute effort. You will need 4 blocks like on the right, and 8 blocks like on the left. I'm calling the blocks on the right- Swiss flag: Make 4 of them. Piece 4 white-red-white 1 1/2" squares for the sashing. Four (4) 3 1/2" light squares. Lay out your pieces and blocks as shown above. Piece together in rows, pressing toward the dark when possible. These are small blocks, so take a tad smaller a seam allowance. Ta-Da! Admire your little creation! 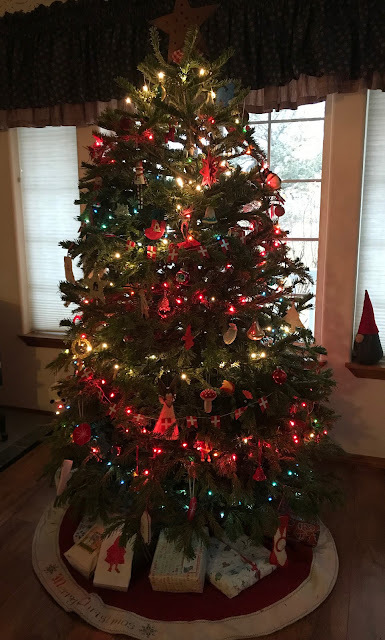 Merry Christmas lovely friends. 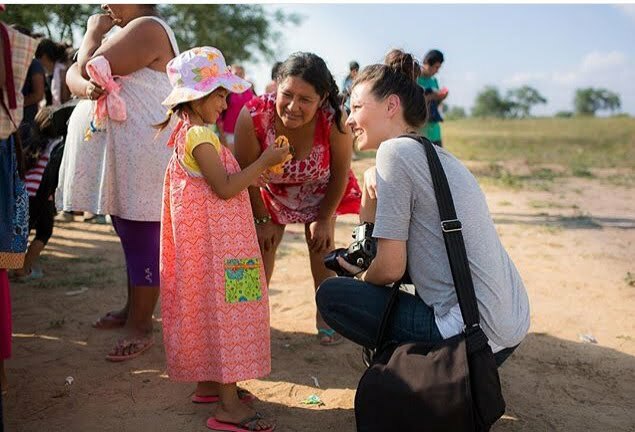 I'm sorry I do not have the time to acknowledge every comment, because I do have a job outside my home, but I appreciate all your comments and emails so much! Thank you quilt guilds who have invited me to come and speak at your guild this year and next- I'm honored! The blue and white spotted on ebay. Added to say: I have heard from a few of you that someone else has done a quiltalong with this pattern. Great! That just means we both like it!! 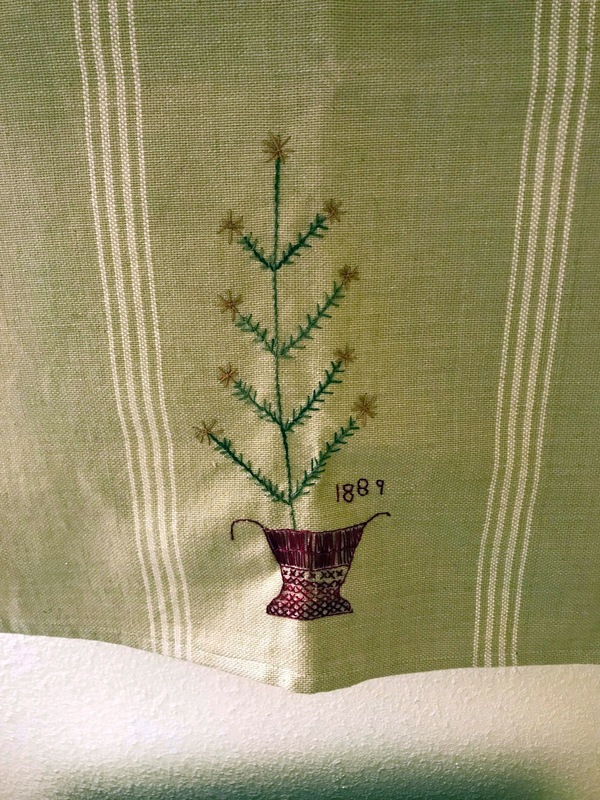 It was designed by a quiltmaker about 1900. It was a larger quilt that the auction says they have cut down to finish into a few little quilts. You can see it, or purchase it HERE. Happy Friday! If you missed my first post about stringalong 2019 check it out HERE. Once you have found a pattern you'd like to make, (when I say pattern that doesn't mean you have to purchase one! When I took a string quilt class with Gwen Marston we made our own pattern if we wanted a specific block- you can do it!) you'll need to figure out what size you'd like your quilt to be. I have already started blocks several months ago that I stalled out on. You can see what I'm doing HERE. I want my quilt to be about 60x72 and my blocks will finish at 4". So my setting is 15 blocks across, 18 blocks down. I need a total of 270 blocks! If I want to get my top done in October, I'll have 10 months to work on it. Divide 270 blocks by 10 months, I'll need to make 27 blocks a month to meet my goal. It is simple math, but hopefully I am helping and not confusing you. Someone gave me a few blocks that this one would be great to use them in. My blocks will finish at 6". 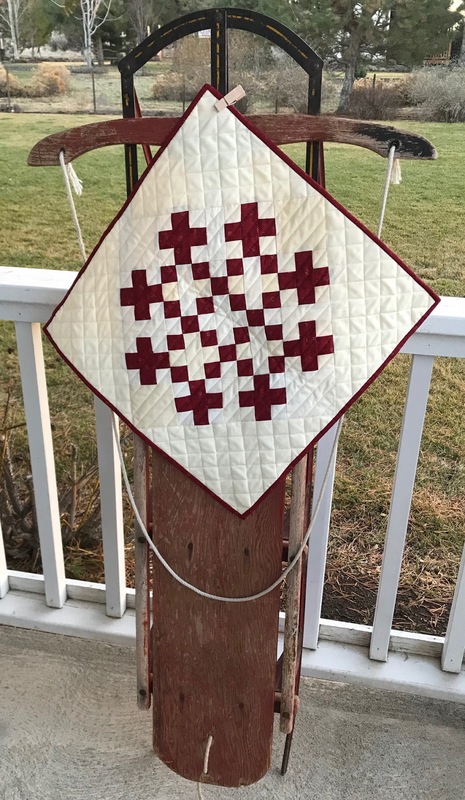 If I wanted this quilt to be about the same size as the other one, 60x72, I would need 10 blocks x 12 blocks for a total of 120 blocks. Using that same 10 months I only need to make 12 of these each month. Let me know if I can help you figure it out. If you have Electric Quilt- use it! Next thing you need is strings! I throw scraps in a drawer. Then sometimes I put them in bags with alike colors. 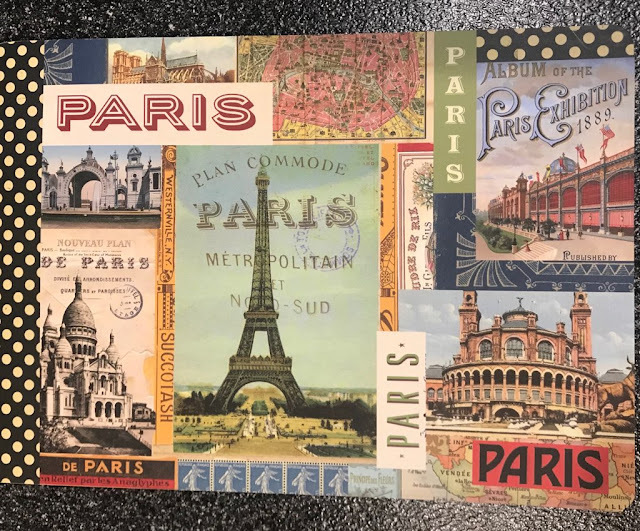 Then "sometimes" I iron them and cut them into strips, squares, or strings, which I consider too small for squares or evenly cut strips. If you just have scraps, cut them into usable size strings. Then the strings get put in a bag. My friend, Linda, gave me a big bag of them so I added with what I had and now I have plenty. I like to use some type of foundation to stabilize my strings. You can also use muslin or just ugly fabric, or none at all. Make a plan now so you'll be ready to dive in at the first of the year! How many blocks per month? I'm excited! There are so many varieties that no 2 quilts will ever be the same!! I hope I've explained it clearly. 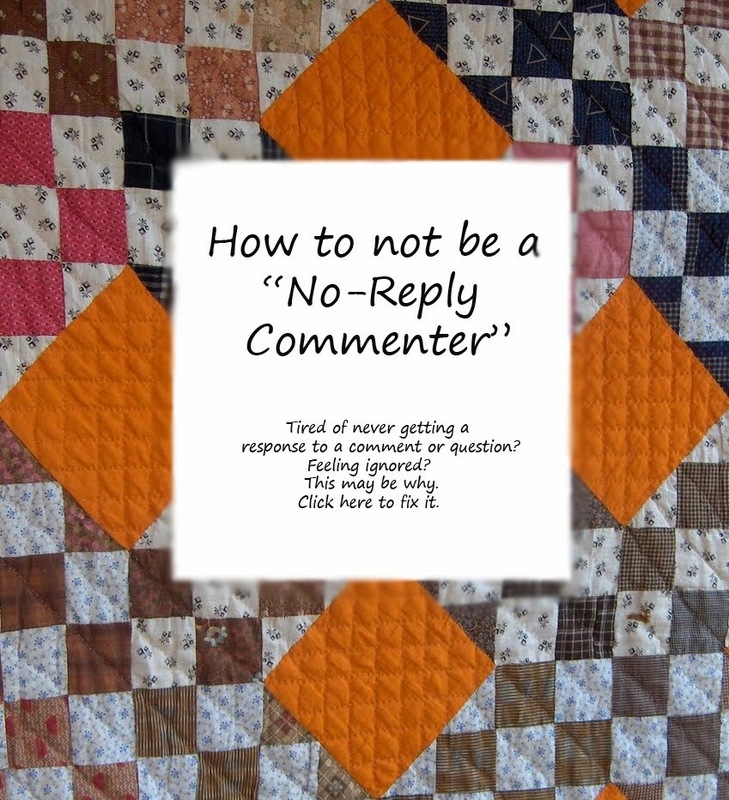 Of course, if you are just testing the waters with a small quilt you likely will get it done in one month. That's great too! 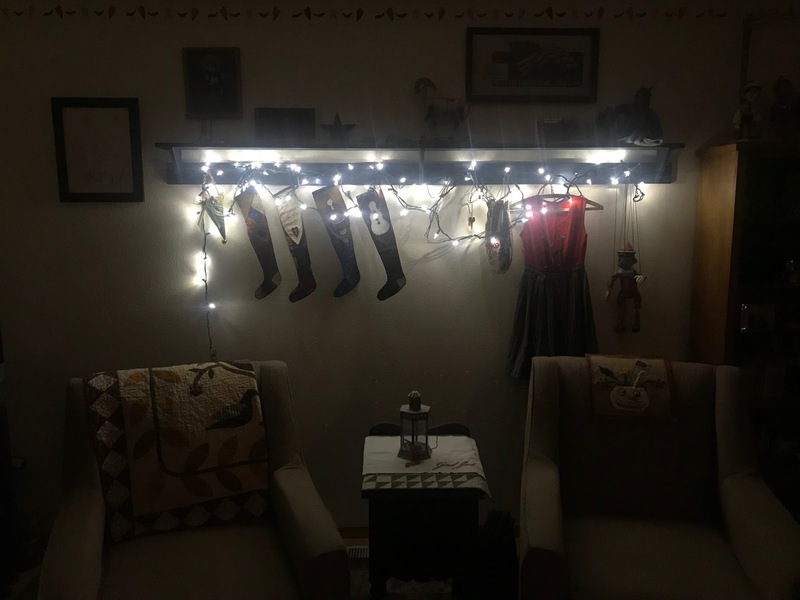 We will have a linky party at the end of every month so we can see your progress and stay on track. 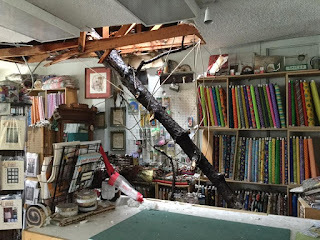 If you've been reading my blog for any length of time you know I'm a big fan of Gay at Sentimental Stitches. 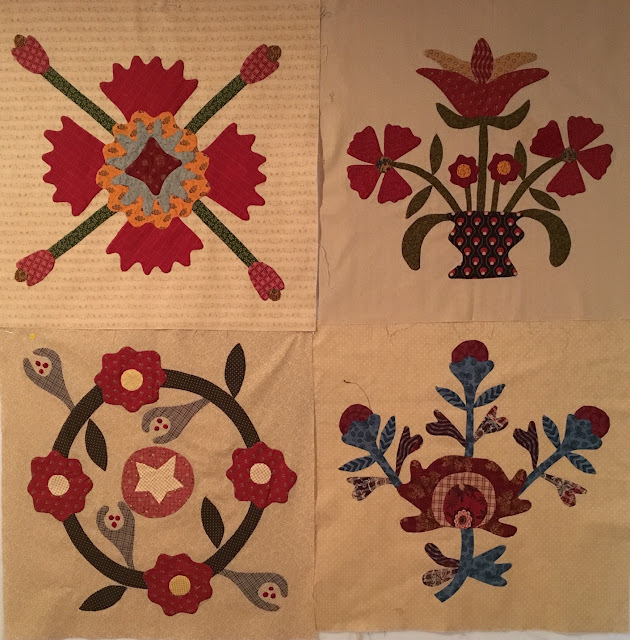 Her patterns are amazing and she has done a bit of digging on the history of them which gives them added appeal. 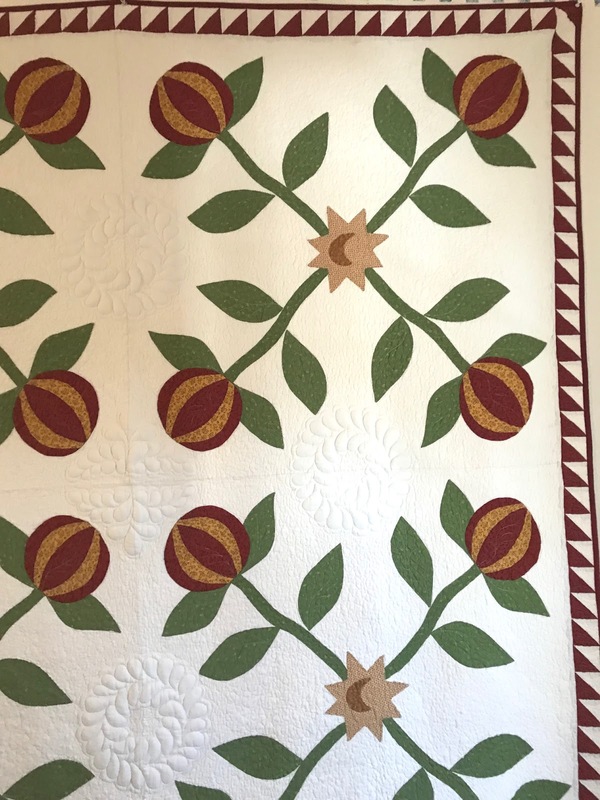 I've done Beyond the Cherry Tree, Benjamin Biggs, Just takes 2, and 1857 Album Quilt. 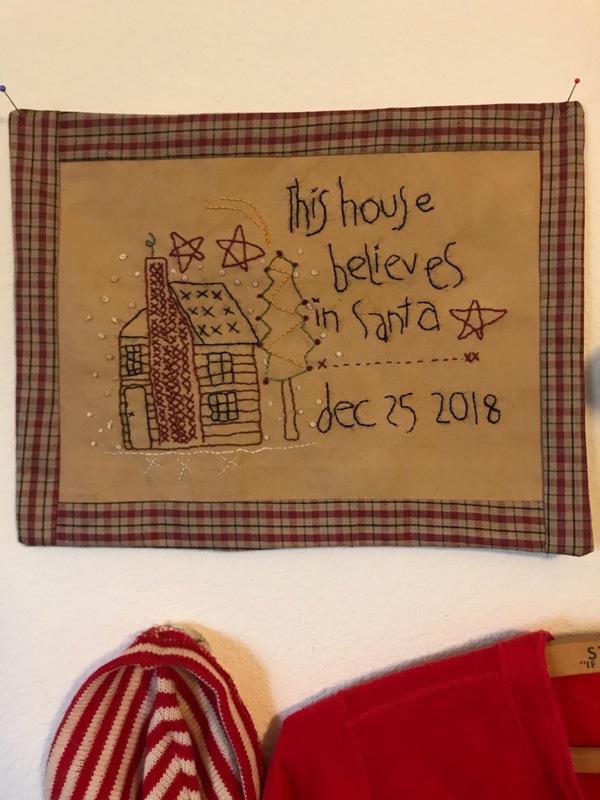 I've been saving the Dear Daughter blocks and December is the last month! Make sure you pick up your set HERE. If anybody ever sees a reproduction blue like this, or one that could pass as a reproduction, please let me know. 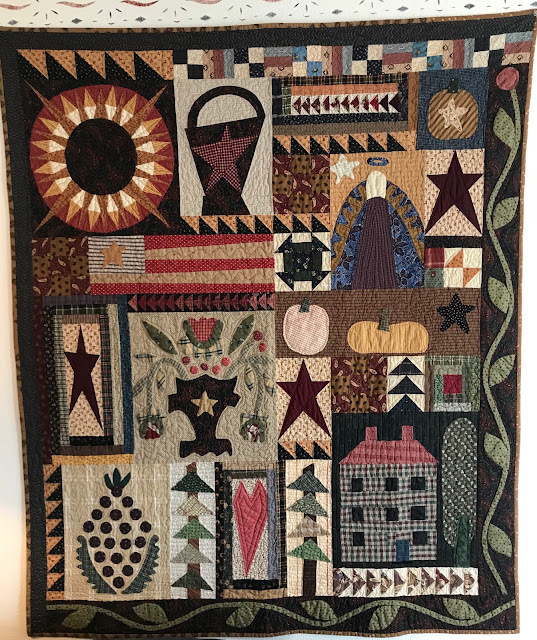 For as old as the quilt is the blue fabric is so vivid! It makes this quilt extra charming! I dug around some more and found these! 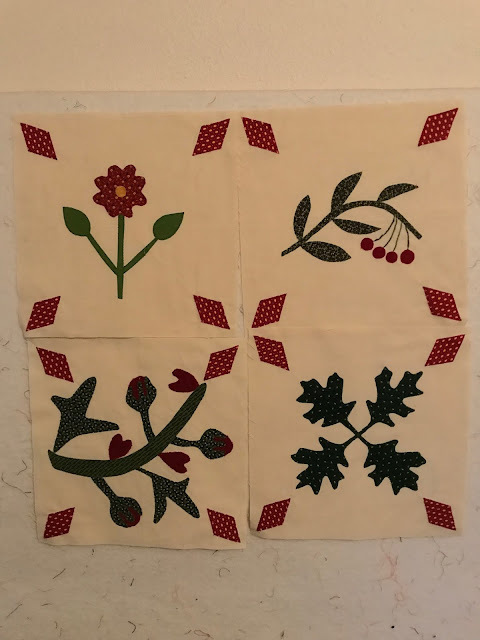 Some needed a bit more applique, but I was grateful to have them mostly finished. I've finished these 4 recently and have another stack to complete! 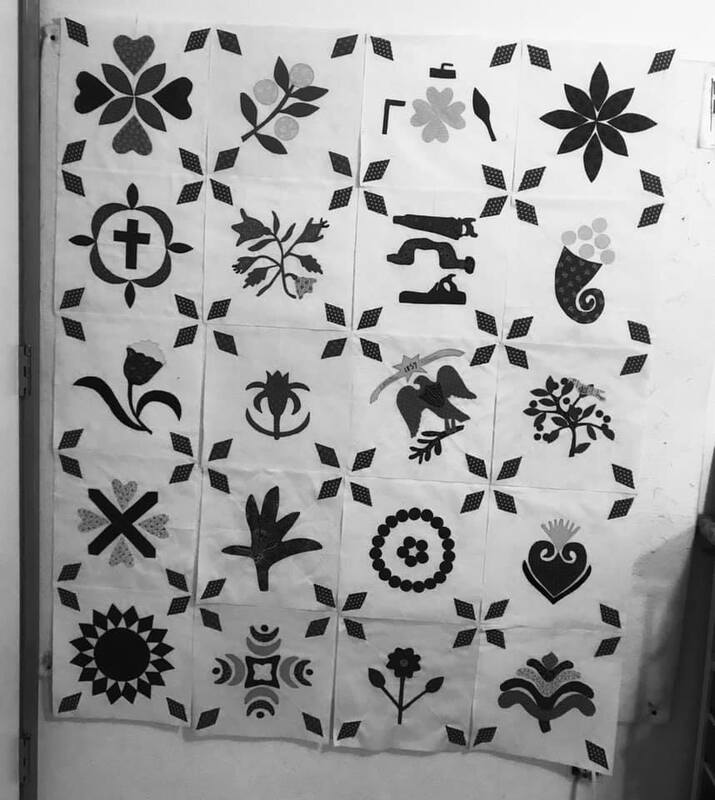 I doubt I'll end up making all of the blocks, but enough to call it a quilt to cover up with. Gay will be starting another project in 2019 and I look forward to seeing what she will share. 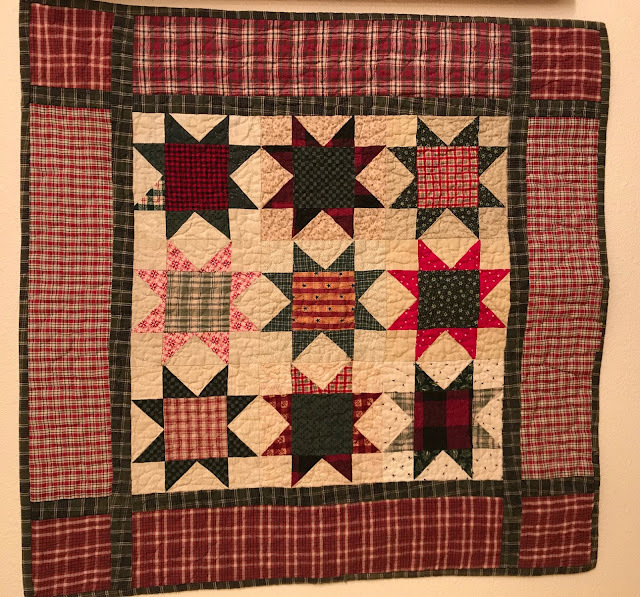 Friday we are talking string quilts again. I hope you have found a pattern you want to make. 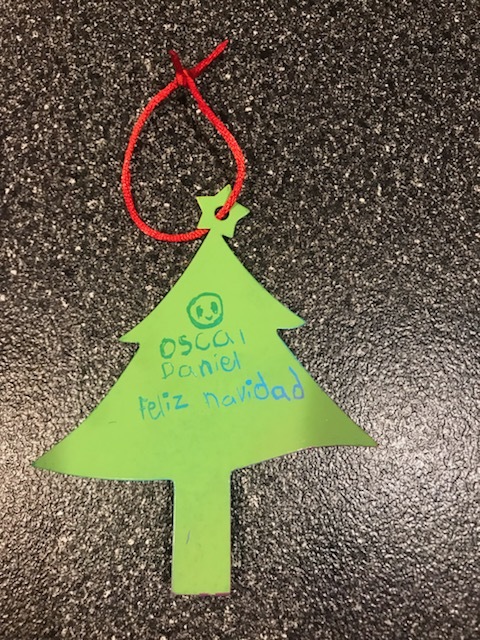 I received the cutest little ornament from a boy whose family works in the garbage dump in Guatemala. He is trying to go to school so he can change his future. 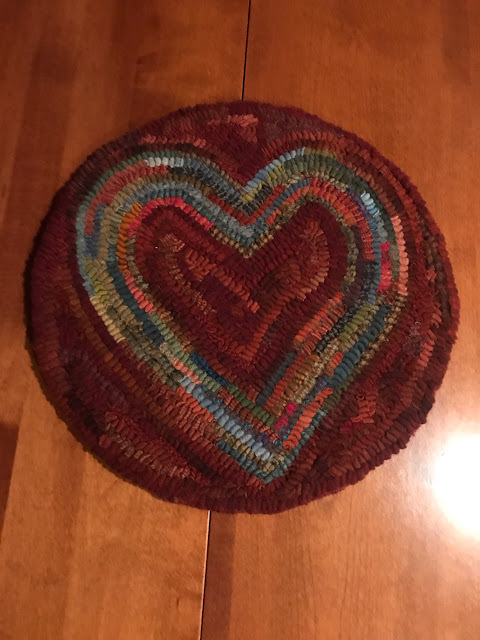 Kelley sent me this adorable gorgeous hooked mat! This is much larger than it looks in the photo- it is about 14" across so lots of time into making this. Thank you Kelley- it is a gift that I will treasure!! I was involved in a swap earlier this year and my swap partner remembered me this holiday! Thank you Elizabeth!! It's a notepad and it is so unique and lovely. 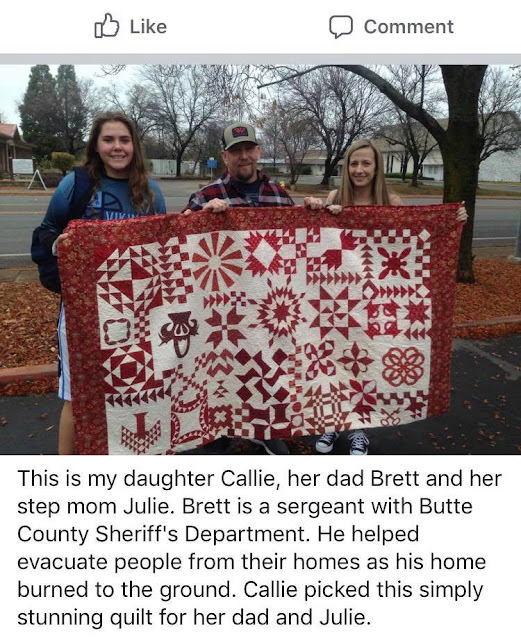 If you are in my facebook group I've shared where a few of our donated quilts have gone. And I've mentioned trying to enter a blue and white quilt for exhibit with Quilts, Inc. Now is the time to enter! Check it out HERE. If you are not in my Facebook group and would like to join, jump on over HERE! I haven't published any books or patterns, don't have anything to sell, but I like to think we support each other and have a fun time! Thanks! Have a wonderful week!